openSUSE Education team is proud to present openSUSE-Edu Li-f-e (Linux for Education) based on openSUSE Leap 42.1. The image is a "hybrid" iso image, the same image can be used to burn a Live DVD or to create a Live USB stick. This release includes carefully selected software for students, educators as well as parents. The software selection encompasses everything required to make computers productive for either home or educational use without having to install anything additional. The Live DVD contains KIWI-LTSP server that can be enabled even by non-technical user], it comes bundled with tons of useful applications from [[Education_repositories|openSUSE Education], Build Service and Packman repositories. With the KIWI-LTSP server you can PXE(network) boot other PCs to use this live DVD without installing or modifying anything on them. Booting from hard disk again will leave those PCs as they were. (Please note that running LTSP from Live DVD/USB is meant for demo/testing purpose only, install on the hard disk to use it in production). The aim of this DVD is to provide complete education and development resources for parents, students, teachers as well as IT admins running labs at educational institutes, if you think there is something missing that you absolutely must have on the DVD, drop us a line see "Communicate" here. 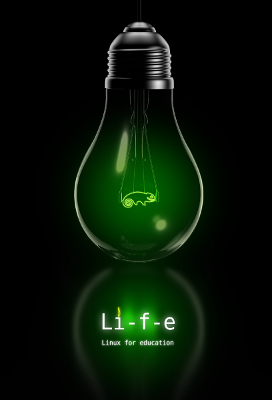 Note: As openSUSE project does not support live media installation, there will not be Li-f-e based on current release. Check out Li-f-e based on Ubuntu LTS and links to alternative Educational distributions here. Great collection of Education softwares are available in our build service repository which can be added to standard openSUSE install. Note: Some packages may not be on the li-f-e media but available from our build service repository. This Live DVD includes KIWI-LTSP server. To Test the KIWI-LTSP Server follow the according this guide. Up to 5 users can be logged in to the live LTSP server (You will need minimum 512MB RAM+200M per additional user). More users can be added after installing on hard disk. To test epoptes with LTSP in live environment, run epoptes as "linux" user after booting clients. After installation the user who runs epoptes has to be added to epoptes group using YaST user management. Network booting(PXE) clients directly from the PC running this live DVD will give access to all of the applications on the DVD as well as all Desktop Environments. To test the Live KIWI-LTSP users can login from thinclient terminals as linux1-linux5, password is linux. For root there is no password. Libreoffice.Org Edition with improved interoperability and many additional features not found in OpenOffice. Download from the openSUSE Build Service repository See Restricted formats for more. See the SDB article Live USB stick for instructions on creating live USB stick out of openSUSE-Edu-Li-f-e. Using live-fat-stick script or live-usb-gui is recommended when using vfat(fat32) USB stick or hard disk. Any PC or a Virtual Machine with 1G RAM. PC should have a DVD drive or should be USB boot capable. For installation minimum 25GB partition is required, 50GB is recommended if you intend to use Li-f-e as your primary OS. Switch to GRUB if your hardware does not support EFI booting when using x86_64 edition of Li-f-e.
Why are so many packages and Desktop Environment installed? The idea of this distribution is to introduce and make available as many tools as possible for teachers to make their task easier and for student to learn from. Choice of so many desktop environment is available so that users can explore each one and use the one they are most comfortable with. For such a big image why are my locale not included? There are over 100 locales available in various stages of completion, so even if each takes just a few MB we would not be able to incorporate a lot of them, besides adding your language after installation via yast is easy and is required to be done just once in the life time of the distribution of almost 2 years. This page was last modified on 1 January 2017, at 06:40. This page has been accessed 366,080 times.